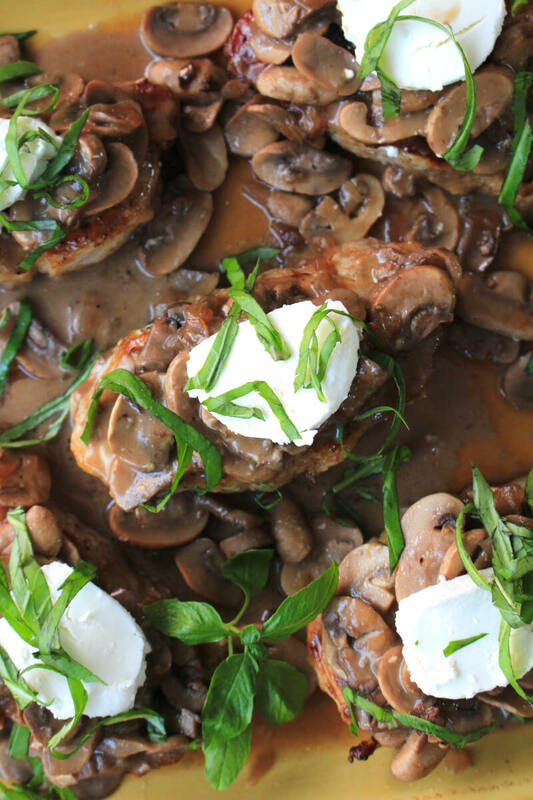 Mushroom and Goat Cheese Pork Chops is an elegant, yet easy to make main dish recipe that features juicy pork chops topped with an irresistible combination of red wine mushrooms, creamy goat cheese, and fresh basil. I'm very particular about how I write my grocery lists. Shopping with a list is the only way I like to shop, otherwise, I end up with a cart overflowing with impulse buys and way too many "I forgot I needed this" items. When I write my list, I separate the groceries I need by section of the store. It keeps me from zig-zagging back and forth and satisfies my borderline OCD tendencies. The only sections where I put down my list and throw all caution to the wind are the produce section and meat section. I buy extra fruits, veggies, and proteins depending on what looks good. 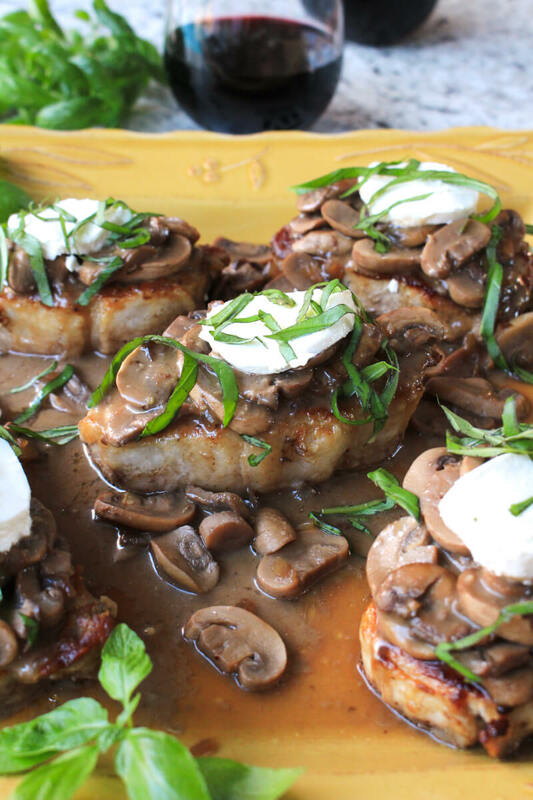 That's how I ended up with the pork chops and the mushrooms for this recipe! I had some goat cheese left over from a previous meal and when I was surveying the contents of my fridge the other night for meal ideas, I had the bright idea to combine these three things in a recipe. These pork chops are started in a skillet and then finished in the oven, surrounded by mushrooms and onions simmered in a rich red wine sauce. When they come out of the oven, they are finished with goat cheese and fresh basil. I think the fresh basil cut the richness of the mushrooms and goat cheese perfectly. I don't suggest skipping it! Whether you make these pork chops for Sunday supper or a dinner party with friends, I hope you love them! Enjoy! 2. Season your pork chops with salt and pepper. Heat olive oil over medium-high heat in an oven-safe skillet. Sear the pork chops for 3 minutes, flip, and continue searing for 1 additional minute. Remove the pork chops from the skillet and set aside. 3. Reduce the heat to medium and add the remaining olive oil to the skillet. Saute the mushrooms for 3 minutes without stirring. Stir, add the onions to the skillet, season with the salt and pepper, and continue cooking for an additional 3 minutes, stirring occasionally. 4. Add the beef stock and red wine to the skillet and simmer for 5 minutes. 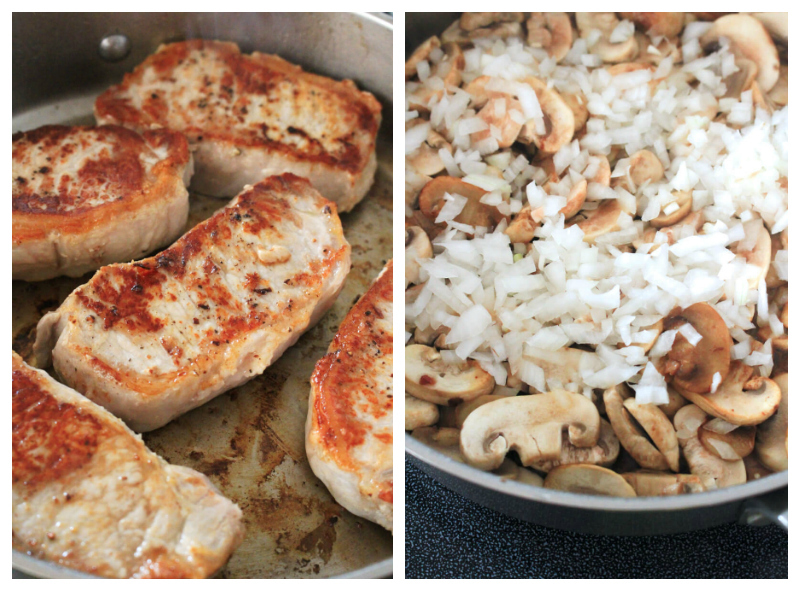 Top the mushrooms and onions with the pork chops and their juices. Bake in the preheated oven for 20 minutes or until internal temperature reaches 160 degrees F.
5. Remove the pork chops from the oven and place onto a serving platter. With a slotted spoon, remove the mushrooms from the skillet and spoon them over the pork chops, leaving the juices in the pan. Whisk 2 teaspoons of flour into the juices and simmer over medium heat until slightly thickened. Spoon the sauce over the pork chops and mushrooms. Top with the goat cheese and fresh basil.